The Sagrada Familia in one of the main tourist attractions in Barcelona. With its unique and otherworldly appearance, over 100 year history, and stunning modernist architecture, this awe-inspiring, futuristic basilica is well deserving of it place on our list of things to do in Barcelona. 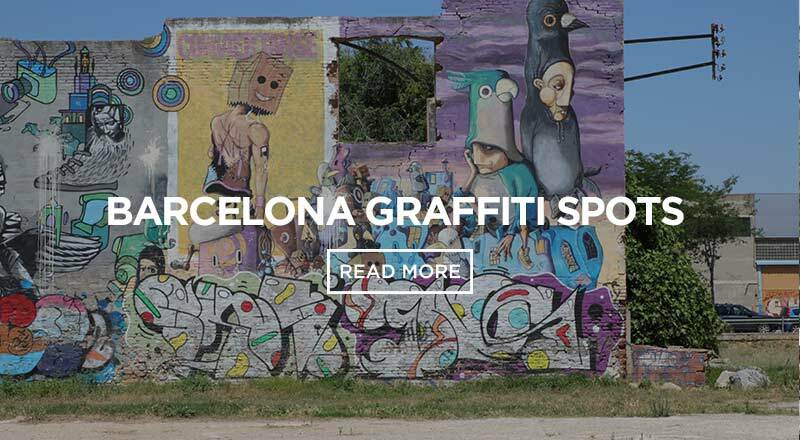 Located just outside of the city center and just a few blocks from the stunning Hospital de Sant Pau, the Sagrada Familia is not exactly centrally located but is very easy to get to by Metro (subway, underground, U-bahn, whatever you want to call it). And once you are at the Sagrada Familia, it might be a good idea to walk up the Avenguda de Gaudi, get a bite to eat and check out the Hospital de Sant Pau. There is nothing else like it in the world. 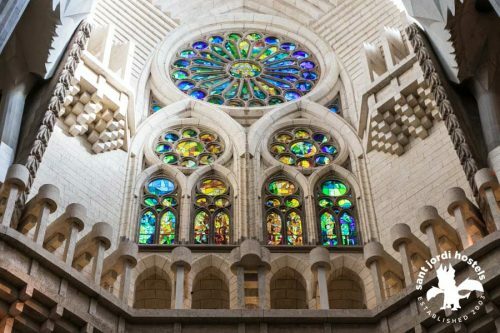 Imagine, the Notre Damn Cathredal in Paris and then add a little Egyptian Pyramid, some Hagia Sofia, a pinch of Taj Mahal, stir it all up in a big pot of catholic LSD and you might get something resembling the Sagrada Familia – or what the Sagrada Familia will be once it is completed. 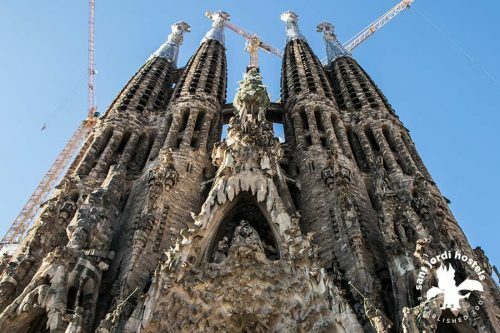 In addition to its otherworldly beauty and outright trippy architecture, the Sagrada Familia has been under construction for over 100 years and will not be fully completed until at least 2026. By the time the Basilica is finished it will have been over 140 years since construction began. The Sagrada Familia is one of the only buildings in the world that is still under construction today and has been for over a hundred years. It truly offers a once-in-a-lifetime experience. Designed by Antoni Gaudi at the end of the 19th century the Sagrada Familia has been under construction for over 100 years. 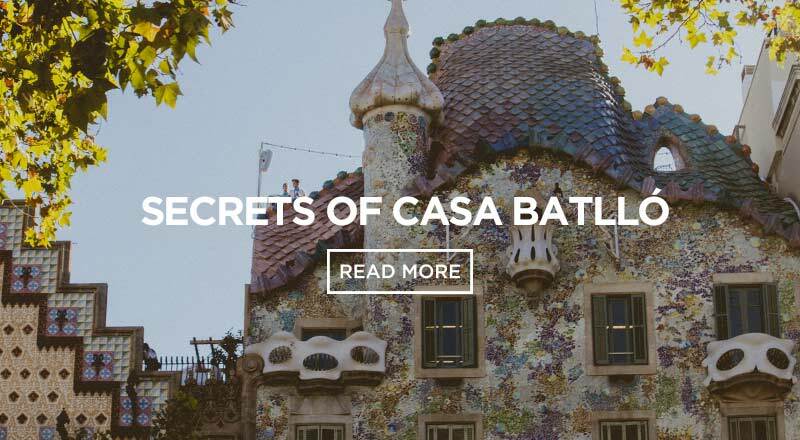 It was Antoni Gaudi’s masterpiece and he dedicated the last several years of his life to the project. Planned from the beginning to be a project that would span several generations, the Sagrada Familia Basilica has an impressive history and promises an inspired future. 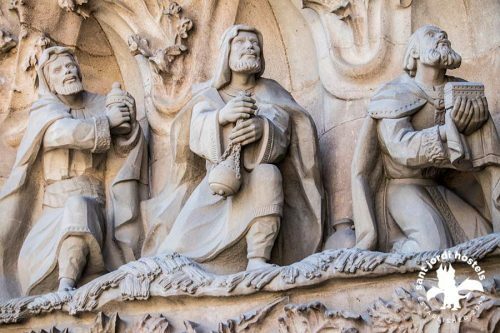 For more information about the history of the Sagrada Familia, the symbology of the Sagrada Familia, the architecture of the Sagrada Familia, the future plans for the Sagrada familia and much much more, check out the Sagrada Familia website. 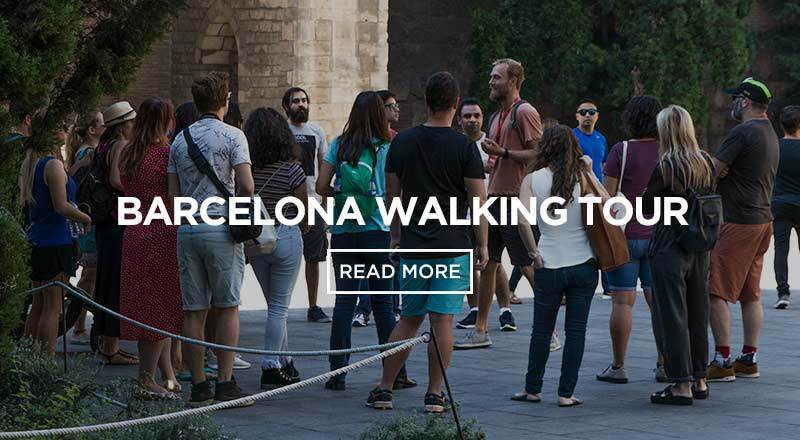 How to get to the Sagrada Familia? The Sagrada Familia is not far at all from the city center, but it is not quite close enough to get there by foot. Take the Metro. Because the metro system in Barcelona is so amazingly efficient and clean and safe and inexpensive and…. I could go on and on… just get yourself a T-10 (10 trip ticket) and use the metro like crazy. The Sagrada Familia is such an important site in Barcelona that it has its own metro stop on 2 different metro lines – the L2 (Purple) and the L5 (Blue). This makes it ridiculously easy to get to. Just take the metro to the Sagrada Familia stop, exit the metro, go up the stairs to street level and look up. You can’t miss it! If you happen to be staying at our Sant Jordi Hostel Sagrada Familia Hostel in Barcleona, don’t bother taking the metro. Just walk out the front door of the hostel, go to your left and continue straight on ‘Carrer del Rossello’ for 4 blocks. 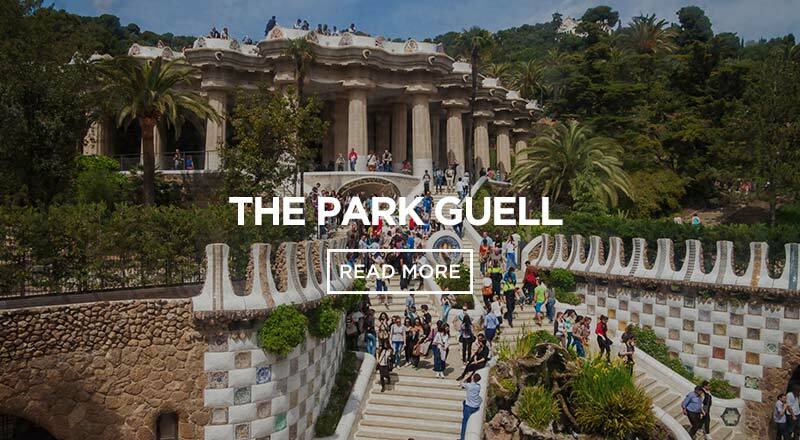 You will run right into the ‘Avinguda de Gaudi’, which contects the Sagrada Familia with the Hospital de Sant Pau. Go left on the ‘Avinguda de Gaudi’ and it is just one block to the Sagrada Familia. The area around the Sagrada Familia is very touristy. But, if you go up the Avinguda de Gaudi, the closer you get to the Hospital de Sant Pau (the farther away from the Sagrada Familia), the more local the area becomes. There are good local cafes with decent food at reasonable prices. Check out the Nostrum on ‘Carrer de los Catillejos’ just off the ‘Avenguda de Gaudi’. Its not a cafe (more healthy take-away style) but you can get a good meal for very cheap. Get the Nostrum Fan’s Club Card for 3€ and you can pick from meals for 1€, 2€ or 3€. There are Nostrums all over Barcelona and you can keep using the Fan’s Club Card to get good meals for cheap in Barcelona. 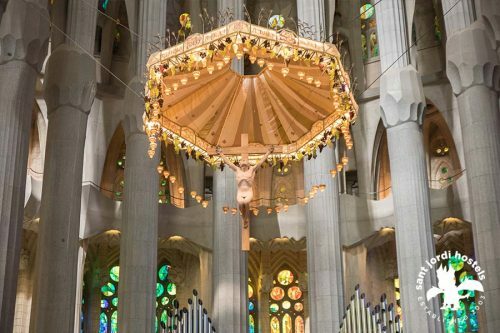 *For more information on additional pricing options, visit the official Basilica Sagrada Familia website. The schedule below is for the Nativity Facade – the lighting of the side entrance of the church for night-time viewing. *the passion facade is also illuminated regularly. 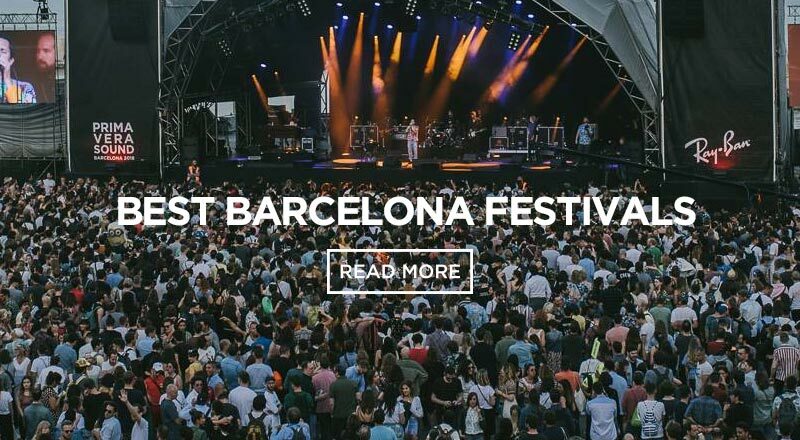 The schedule is not fixed and depends on the amount of daylight. 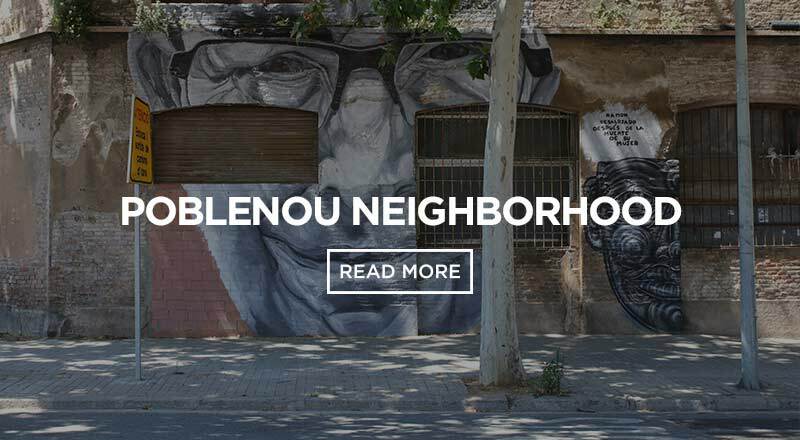 Here is the ultimate guide for the Poblenou neighborhood in Barcelona!